This time four months ago I was in surgery. I had said goodbye to my husband, sister and mum in person and my dad on the phone. I had been scrubbed clean and had my hair plaited in the hope that it wouldn’t get too knotted in the bedridden days after surgery. I had been wheeled down to the operating theatre, chatting to the anaesthetist, and trying to make light of having various IV lines placed (one of my greatest fears). I met my surgeon, Fabio, and was told off for reminding them all that if this didn’t quite go to plan then I was on the organ donor register myself. Looking back, that might not have been the most trusting remark! The drugs flowed into my veins, I breathed into the face mask I was given as deeply as my old, tired lungs could, and I drifted off to sleep. During that 10 hour surgery, various skilful medics worked busily away. My dying lungs were removed and replaced with healthy, vibrant, wonderfully ALIVE lungs. And underneath, as always, were the everlasting arms of God keeping me safe. care to astonishing recovery and fast discharge. I hope to write about this in greater detail but for now suffice to say that, underneath, as always, were the everlasting arms of God keeping me safe. Today I celebrated my new lungs by living what most might call a mundane day. I have gone for a walk, emptied and filled the dishwasher, washed and dried a rather large pile of clothes, played with our dog, prepared and eaten meals, done a craft project, read a book, and, my favourite, just sat down and breathed deeply. But, God be praised, there is no such thing as a mundane day. I still don’t have the words to do justice to the feeling of air rushing into my lungs, the breath growing deeper and deeper until there is no more space, then out it comes in a long, faintly audible sigh. I sit quietly with a smile on my lips, trying to comprehend the blessing I am experiencing. I don’t know what the future holds. In one sense, the future feels more uncertain than the future I thought I had with end stage CF lungs. The coming years might hold superb health and all that entails or fast organ rejection and all that entails. These past four months have been like no others in my life and my expectations of what life is have been challenged. I have experienced my lowest lows and my highest highs. I have been the closest I have ever been to death and the most alive that I remember feeling. And I have known the most deeply I have ever known that underneath, as always, are the everlasting arms of God keeping me safe. Thank you to my donor and family. 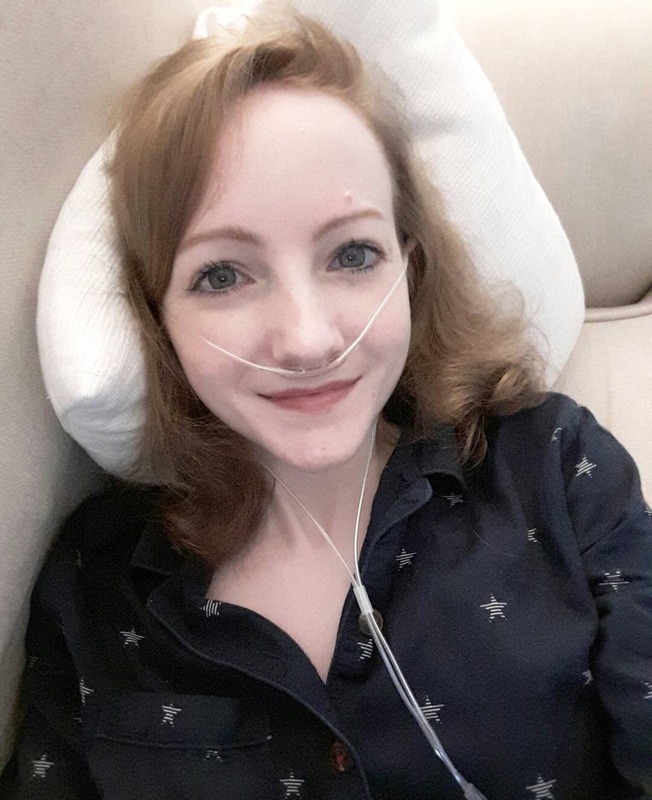 To mark Cystic Fibrosis Awareness Week, I chatted to The War Cry about being a Christian and living with CF. Believing in God changes everything. Without him, cystic fibrosis is an unlucky mistake or a cruel twist of fate – it’s a death sentence… With him, I see it as part of a loving plan for my life and a reason to look forward to eternal life. I’m in the April edition Woman Alive magazine talking about living life as a Christian with CF. “My life is filled with mundane tasks and bodily brokenness, and it’s easy to think that there is nothing of value here. But, as one of my favourite quotes says, ‘God comes to us disguised as our life’ [Paula D’Arcy] and that transforms everything. God is here making himself known to me in the long hours of physiotherapy, the tears of pain and confusion, and the dark nights of the soul which can seem unending. I’ve lost a decent proportion of my hearing due to antibiotics and I will probably continue to lose more and more. The idea that I could go deaf scares me. My days are filled with listening to things because I’m not well enough to do much else. I ask God over and over to spare my hearing. And then…. I hear the noise from next door and get annoyed about it. It shouldn’t surprise me that I forget my blessings so easily. But I do. Again and again. Perhaps it will be easier to remember if I say it out loud. Here goes: I am grateful for the noise coming through my walls. It tells me that I can still hear things, that I have the joy and responsibility of having neighbours, that I am blessed enough to live in a house, and that I have the luxury of so much quiet that I notice when there is noise. Thank you, Lord, for your good gifts, even though I am slow to recognise them as such. It’s a back-in-pyjamas-by-5pm, body yelling at me to just stop trying to do the next thing kind of day. I’m not often very good at listening to my body (though I’m excellent at telling other people to listen to theirs!). I always want to keep doing things because in my mind, doing things = being useful. It’s one of the hardest lessons God is teaching me through CF: His view of useful and worthwhile is different to my own. He’s given me a body that needs a lot of rest and can’t do a lot of ‘normal’ things and yet all His promises count for me as well. I’m tempted to think that I can be worthwhile despite my weakness, yet He tells me I can be worthwhile even in my weakest moments. How? Because His power is made perfect in weakness. It’s more obvious to me than most – I can’t live life by myself. I mean, half the time I can’t even get my own jeans off at the end of the day. Being weak makes me see my need. And when I see my need, He is there to fill it. Father, Saviour, Breath-giver. Comforter. Protector. Burden-bearer. .
That’s not just a reference to my vertically challenged frame (4′ 11″, because I know you’re wondering!) but a feeling that comes from deep down within me. I know my life is a small one. I often have days where I’m on my own until David gets back in the evening. I’m not particularly active on social media. I can count on one hand the number of people who know me very well. I know all that every day, but some days the knowing and the feeling come together almost tangibly and I marvel at the magnitude of ants. Right now I sit here curled up in my armchair with blankets around me. My rising temperature warns me that in yet another round of Ruth vs Bacteria, my body is losing. My weakness is obvious and painful. I can’t even win against an organism I can’t even see. And yet a glance up from my armchair reassures me. God’s got his paintbrush out and the sky is a plethora of colours. Orange! Pink! Purple! Grey! Not even a pentachromat could tell you all the colours. The God who streaks the sky with colour also makes Himself known in smaller ways; a still, small voice, a dove. The God who is greater than my mind can begin to fathom cares about smaller things; the sparrows, the flowers, the hairs on our heads. Small is a privileged place to be. Small is a wonderful thing to feel. Small sees myself in an accurate light and helps me see God as more mighty, more glorious, more loving. Today I feel small and for that I am grateful. Save us from the strength that harms. The last few weeks have been hard. Breathing is a struggle and uses enough of my mind to make it difficult to focus properly on anything else. My oxygen flow rate is higher and so the soundtrack to my days is the whistling and blowing of air into my nose. Silence is something I remember but no longer experience. But this isn’t the end. I found this artwork on eBay and love it. It captures my idea of bliss. Winter, the peace and stillness that comes with snow everywhere, walking with my favourite person and our goofy dog through the trees. That has never happened and probably won’t in this lifetime. But it makes me long for the next even more. Pain is not the end. Peace is coming. Five years. Half a decade. To many people five years might seem just the start of a marriage. But when at the beginning you were expecting two years, five is a gloriously long time. Five is a cup-overflowing, ‘God, how come you love us THIS much’ time. This year we bought a house. Another unexpected Yes. ‘Father, give us time.’ Yes! ‘Father, we need somewhere to live.’ Yes! We are told that God is the Father who loves to give good gifts to His children. We see the sparkling, majestic goodness of God in the ‘Yes’s of the last five years. And we also see His goodness, His quiet, persistent, day-by-day kind of goodness, in the ‘No’s. This past year has had its challenges. My health is far worse and more unstable than it has been before and the future can feel more scary than it has in previous years. As we enter our sixth year of marriage we know more about how little we know. But we know the basics in a deeper, truer, more delightful way. We know that God is all-Sovereign, all-loving, all-caring. We know that He has written our story for us and there is nothing better. And we know that after five years, through richer and poorer, through sickness and health, through better and worse, we love more profoundly and are loved more dearly than we would have ever thought. I am so grateful to be living my life next to David. I am often astonished by how far his love goes and how tender that love is. I see his love in the glass of juice he brings me every morning without fail, in the tireless way he works to provide for me, in all the oxygen canister carrying that he does. I see his love in the frequent words ‘tell me what I can do for you’, in the exchanging of fun, exciting days out for yet another quiet day with TV and books because it’s all I can do, in the hand that holds mine when things are just too hard for words. It’s there in a thousand different ways. I know that his love makes no sense in the world’s eyes – why he would choose to love someone so small and so broken – and through him, I live the story of the Gospel every day. Yesterday marked five months of my being on oxygen all the time and I struggle with it every day. The discomfort, inconvenience and social implications are all hard to deal with, not to mention the various emotions that come with understanding what being on oxygen all the time actually means. It’s always hard to admit that my health has taken another significant step down and hard to accept and live happily at a new, restricted, painful normal. Since March 1st I’ve taken off the oxygen tubes for photos, tried not to look in mirrors and gone out far less because on some days even the points and questions of curious children are difficult to cope with. 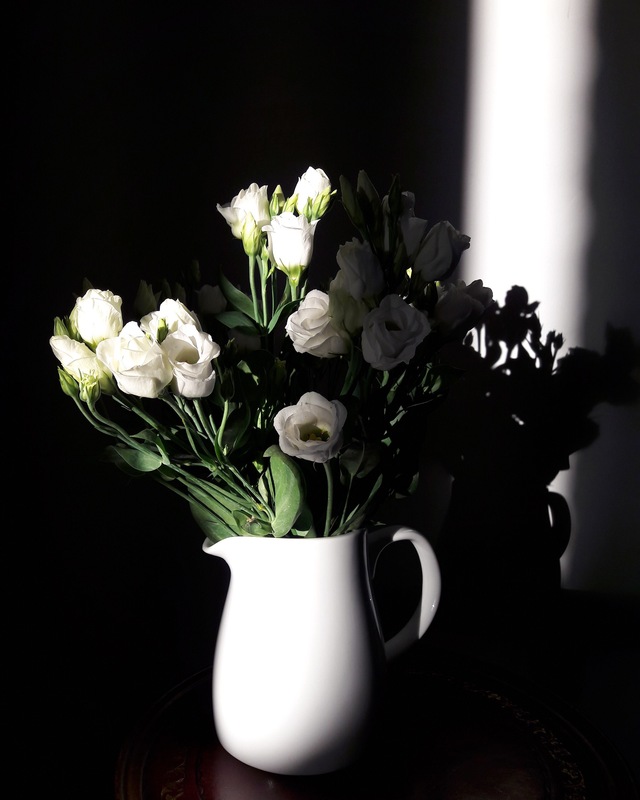 Richard Rohr talks about living with a ‘bright sadness’ – the something inexplicable you see in people who live with suffering and yet have a deep joy at the same time. I love that phrase and it’s come to mind over and over in these past few months. Things are hard and sadness is a natural and legitimate response. But that’s not where it ends. I want to live that bright sadness and the first step is coming to terms with who I am now and learning to be grateful for that. So here I am, oxygen tubes and all. This is me and I’m working on being grateful for it.